Here’s the deal. I’m a city girl. I love concrete and buildings and wearing heels and avoiding the outdoors as much as possible. Recently though, this city girl stepped out of her comfort zone and into the beautiful world of Outaouais in Western Quebec and I’m so glad I did- what an experience! Aventure Lafleche, located just a short drive from Ottawa, Ontario and Gatineau, Quebec, is a destination with so much to offer adventurous families. There’s a huge cave to explore, trails to hike, and an aerial park complete with zip lines. When my group arrived at the park we were given safety harnesses and then went spent some time learning how all the clips and ropes worked. Then we were on our way up, up, up to the first platform where we took turns hooking on to the zip line and flying off over the trees and water below! 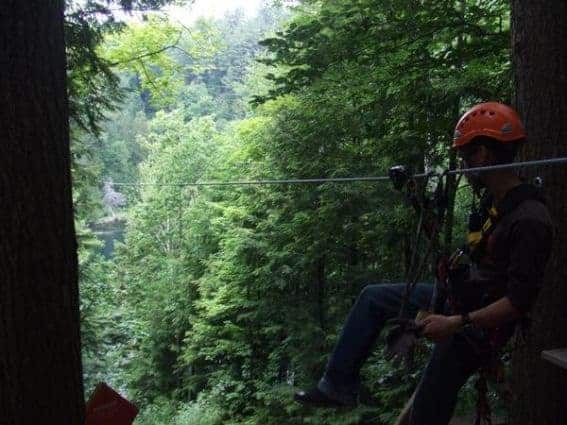 When we weren’t zipping along the zip lines, we also crossed bridges, wires and platforms, all while surrounded by gorgeous Outaouais scenery. Aventure Lafleche has several different aerial park courses for adults and there is also a kids’ park for those 4-5 feet tall. The minimum height for adults on the adult course is 5 feet tall. I come in just above that and did have a little bit of trouble hooking on to the zip line at times. While I was definitely standing on my tiptoes while hooking in, it was worth the effort to get to experience zipping over the ground. Tip: Participants need to be in reasonably good shape to be able to complete the aerial course, which contains lots of climbing and has numerous obstacles to cross. It’s all worth the effort though- what a blast! After flying through the air, it was time for us to head down from sky level and venture down, way underground! Aventure Lafleche is home to the Canadian Shield’s largest cave that is open to visitors. The tour lasts about an hour and is open to those 5 years of age and up. I found it fascinating to go through the tunnels and rooms and experience life underground. One of the most interesting things about this cave is that so much of it is left to be explored. Scientists are frequently on the site working and exploring new areas of the cave and their knowledge about the cave is constantly expanding. If you’re in the area during the winter time, be sure to still consider spending time at Aventure Lafleche. The cave is open year-round (and has a constant temperature year-round) and the park has snowshoeing courses to be enjoyed in the snow! The day after my adventures at Aventure Lafleche, I found myself back up in the air again, this time on a climbing course at Altitude Gym. Altitude Gym is located right in the heart of Gatineau, Quebec and is just a couple of kilometers from downtown Ottawa. As soon as I walked into Altitude Gym, I knew it was a good thing that the location is thousands of miles from my home because my son and husband would want to be there 24 hours a day! Located in a former Catholic church, Altitude Gym offers everything you could want in a climbing location. There are rooms full of walls (17,000 square feet worth!) and courses to practice all types of climbing, as well as an outdoor boulder and an outdoor slack line course. And then there’s the thing that I liked best- the Clip ‘N Climb room! 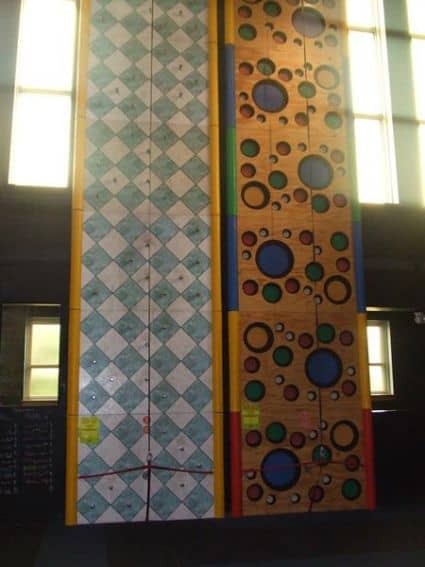 This room is amazing- it’s full of all sorts of different climbing walls, each one presenting a different challenge. And instead of having someone on the other end of your rope, as with traditional climbing, you’re clipped to a safety system on the ground. I really liked this feature because it allowed me to feel safe and independent at the same time. Although my kids weren’t in tow for this outing, there was an 11-year old and her mom with me, and they had a blast racing up and down walls, trying to beat each other’s times and experiencing the adventure together. 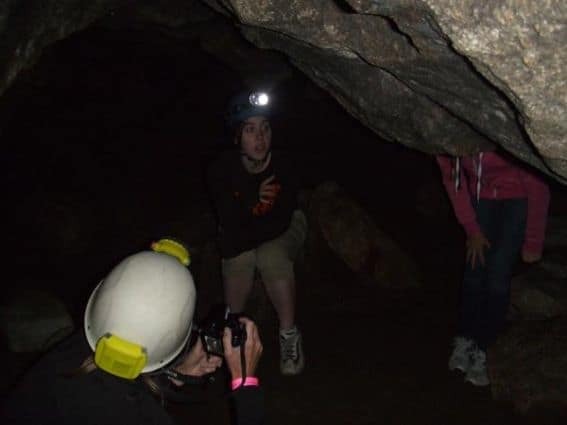 If your family is ready to experience life above (and maybe below ground), definitely check out these two places in Outaouais- what a trip! Thanks to Tourism Outaouais for hosting me on this trip and providing access to these two locations. I loved the hospitality but all opinions are still my own. For more information on the region check out www.outaouaistourism.com.